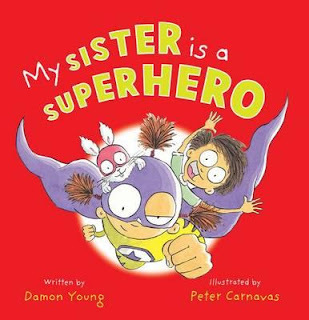 Damon Young and Peter Carnavas are slowly but surely creating the perfect picture book family! First, we had My Nanna is a Ninja, then came My Pop is a Pirate. Now it's time to meet the little sister. And she's a superhero! Just like the other two books in the series, Damon Young's wackily inventive rhyming text is perfectly matched by Peter Carnavas's character-filled illustrations. Every page oozes warmth and humour. The cameo appearances by Nanna, Pop and a whole host of animal characters only add to the fun. I love the word play — 'Some sisters dream of dragons flying dazzling dragonflies' — that is then so beautifully brought to life in the accompanying pictures. After all, when you think about it, it's only logical that dragons should fly on dragonflies! This is a gorgeous bedtime story, or anytime story. And I'm already looking forward to this time next year when I'll hopefully meet the next family member!